Are Airlines and Passengers Ready for a Truce? WHEN weather forecasters predicted severe winter storms across the country in the last few weeks, airlines sent their customers a steady stream of e-mail and text messages, giving them a chance to change their itineraries ahead of the bad weather. In 2008, American Airlines and others began charging to check bags. Carriers have kept adding fees, whether for food or services. Those who took advantage of the waivers had what has become a rare consolation in air travel: they received a service from the airlines without paying for it. In the space of 18 months, the concept of a plane ticket has been transformed from an all-inclusive purchase to a pay-as-you-go plan, turning the relationship between airlines and customers increasingly sour. 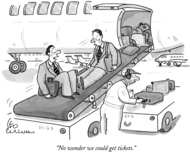 Every time a passenger books a ticket, it seems, major airlines have come up with more ways to charge for what once was free, like fees for reserving more desirable seats in the economy section of the plane. Adding to travelers%u2019 frustration is that the long-cited reason for the switch to %u201C� la carte%u201D pricing %u2014 record oil prices %u2014 is no longer the driving force behind the changes. Instead, airlines now cite their inability to make money, and consumers%u2019 resistance to higher ticket prices, as their reason for thinking up new ways to make customers pay extra. Over the last decade, they lost $55 billion, according to the International Air Transport Association, the airlines%u2019 global trade group. And the outlook for 2010 remains glum. %u201CWe need to return to profitability, and we need to do so immediately,%u201D says Mark Bergsrud, the senior vice president for marketing at Continental Airlines, echoing what has become an industry mantra. He and some other airline executives offer another line of reasoning for the new environment: the me-too factor. Cellphone providers, sports arenas and theaters all add charges on top of the basic price of what they sell. Customers are used to it, so why shouldn%u2019t the airlines join in? There is disagreement about the practice, even in the industry. Robin Hayes, an executive vice president and chief commercial officer at JetBlue Airways, acknowledges that customers find the charges very annoying. %u201COn the whole, for the last 10 years, the industry has done a really rotten job of looking after passengers,%u201D he says. While many customers have accepted the changes, that%u2019s because %u201Cthere%u2019s very little choice,%u201D Mr. Hayes says. %u201CBut the industry would be foolish%u201D to keep adding new charges for things passengers had become accustomed to receiving in the ticket price. JetBlue has added some fees, but not to check the first bag and it still serves some complimentary snacks. Mr. Bergsrud, however, sees the airline industry becoming much more like the hotel industry, which has long charged different room rates based on location and amenities. %u201CIt%u2019s like hotels with an ocean, a garden and a parking-lot view,%u201D Mr. Bergsrud says. He theorizes that passengers having the toughest time accepting the changes are those who fly only a few times a year, while business travelers and those often on the road take the new atmosphere in stride %u2014 in part because they earn enough miles to be exempt from many charges. Airlines say they are not unsympathetic. Daniel P. Garton, the executive vice president for marketing at American Airlines, says its surveys have reflected passengers%u2019 discomfort as the airlines take apart their tickets and recalculate what they want to include in the basic price. But the surveys show that more than half of customers understand why American has had to charge for things they used to expect free, a response Mr. Garton finds encouraging. MAJOR airlines have been cutting back on frills for more than two decades, ever since American began reducing the number of olives it served in each salad. Hot meals were among the first to go on short flights, sacrificed in a wave of cuts after the September 2001 attacks. But lately, the pace of change has been faster, and made travel more complex, uncomfortable and aggravating. %u201CIt%u2019s horrible,%u201D says Matthew B. Stern, a professor of neurology at the University of Pennsylvania who can%u2019t avoid air travel because he lectures and consults around the world. But after his golf clubs were lost on a trip he took with his son, he refuses to check luggage. On longer trips, he sends bags ahead by courier, and for short trips he generally gets by with just one carry-on bag. %u201CTraveling by plane nowadays is like low-class bus travel in the 1950s,%u201D he says. Sarah Maslin Nir contributed reporting. An earlier version of this article incorrectly stated that airlines collectively took in $3.8 million in baggage and other fees. They took in $3.8 billion. Recommend Next Article in Business (3 of 27) � A version of this article appeared in print on February 21, 2010, on page BU1 of the New York edition. I'm kind of dreading the Air Travel portion of my upcoming trip to Dallas.